We invite you to tour our state-of-the-art law building and to observe a class. We can accommodate a limited number of guests on any given day, so please contact us to reserve a space at least three business days prior to your visit. We kindly request that guests only schedule a class observation for when they are available to stay for the entire class. To make a reservation, please send us an email (include your name, the number of people in your party, and which day you would like to visit). Monday 2:00-2:30 p.m. Constitutional Law - 2:30-3:40 p.m.
Tuesday 12:30-1:00 p.m. Criminal Law - 1:00-2:10 p.m.
Wednesday 2:00-2:30 p.m. Constitutional Law - 2:30-3:40 p.m.
Thursday 9:30-10:10 a.m. Property Law - 10:10-11:50 a.m.
Should you require any reasonable accommodations during your visit, please be sure to inform the admissions office in advance. Parking is limited on campus and generally restricted. Permits are required for Lot 470 and lot 402 five days a week from 7:30 a.m. - 5:00 p.m. There is metered parking available along the south side of Kittredge Loop Road (Lot 415) immediately after the roundabout in front of the Fleming Building. If Lot 415 is full, use Lot 406 or Lot 306. All parking highlighted in pink indicates visitor parking. Please see the map below for more detailed parking around the Wolf Law Building. Parking directions to the Wolf Law Building and information on visitor parking can be found below on this page. We look forward to meeting you! If you are arriving at Denver International Airport (DIA), the drive to Boulder takes between 45-90 minutes, depending on route and traffic. There are two primary routes. First, the common route is to exit the airport and follow the access road (Pena Boulevard) approximately 10 miles south to I-70. Take I-70 West to I-270 West. I-270 then merges onto U.S. Route 36 West. This takes you approximately 23 miles to Boulder. Exit Route 36 at Baseline Road; turn left (West towards the mountains), proceed to Broadway, turn right onto Broadway (North). The campus is on the right. You will turn right onto Regent Drive, and right again onto Kittredge Loop Drive. This will take you to the Wolf Law Building. 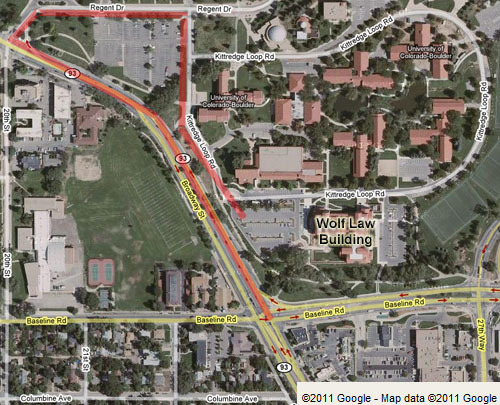 Below is a detailed map from the Baseline Road exit to the law school. The second option from Denver International Airport is quicker and involves far less traffic, but it requires using a toll road. As you exit DIA, you will pass the Rental Car agencies on Pena Boulevard. Shortly after that you should exit onto route E-470. This is a toll road. Toll charges can be found here. Proceed on E-470 until it merges straight into the "Northwest Parkway." Continue on this road until it terminates, at which point you take a right to enter onto Route 36 West toward Boulder. Then follow directions above. To get to Boulder from the Denver area, go west on U.S. 36 (from I-25 or I-270) and exit at Baseline Road. Turn left (west) on Baseline Road, then right (north) on Broadway to campus. From the north, take U.S. 287 south to Highway 119 (Diagonal Highway). Highway 119 becomes Highway 157 (Foothills Parkway) just north of Boulder. Turn right (west) from Foothills Parkway onto Baseline Road. Drive west on Baseline to Broadway, then turn right (north) on Broadway to campus. Take I-70 east to U.S. 6. Go east on U.S. 6 to CO. 58. Turn right (east) on CO. 58 to CO. 93. Make a left (north) onto CO. 93 toward Boulder. CO. 93 will turn into Broadway once in Boulder. Continue on Broadway (west) and you will see the campus on the right shortly after you pass Baseline Rd.